Break through the noise! 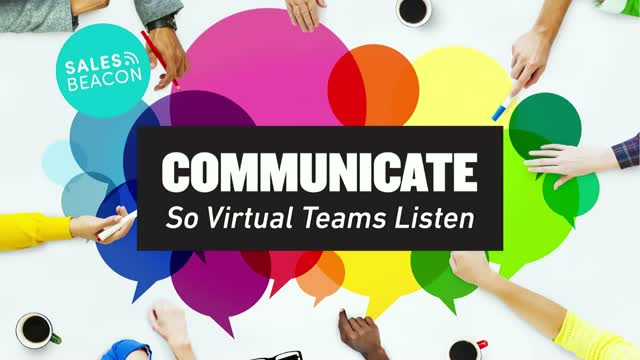 Key communication tips from people who’ve making virtual teams productive for over a decade – all over the world. Want to prove how valuable your team or your project is? Need to secure buy-in from stakeholders or cross functional teams? Quarterly Business Reviews are one way to ensure that you rise above the crowd. Sales Beacon's CEO will share how we create visually dynamic communications based on thousands of QBRs we’ve produced for some of the world’s largest companies. Started using Scrum for your business projects? Having a few challenges? You don’t need to. Find out how some simple adjustments can make Scrum work for business projects. In this lively 30 minute panel discussion, we’ll discover the easy fixes that Sales Beacon implemented to transform a global marketing platform project - from challenging to successful! A new approach to project management. Built for business. Today’s business environment means constant change, endless emails, chats and tweets and never-ending to do lists. Sales Beacon’s proprietary end-to-end program solutions mean managers can focus on strategy, rather than drowning in details. After a decade in some of the world’s largest, fastest-moving companies, we know what it takes to get things done.